Mid- and small-cap stocks in select sectors have fallen over 50% even as the index is down by about 12% from the peak. This could be seen as an opportunity to selectively buy stocks that can generate healthy profits in the next year. Here are some trading picks for you to profit from this Diwali. Come Diwali and the one occasion that most traders and investors look forward to is Muhurat Trading. For long-term investors, this occasion is special because it marks a new beginning. Not only is it the time to look back at the performance of the previous year but also a moment to look ahead with hope. 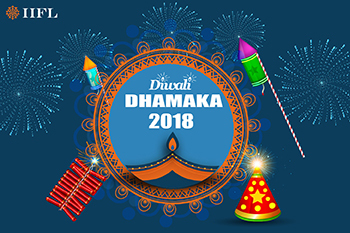 This year is unique because the markets have corrected sharply ahead of Diwali. What's more, mid- and small-cap stocks in select sectors have fallen over 50% even as the index is down by about 12% from the peak. This could be seen as an opportunity to selectively buy stocks that can generate healthy profits in the next year. In the spirit of the season, here are some trading picks for you to profit from this Diwali. Aarti Industries is one of India’s leading manufacturer and exporter of benzene-based intermediates and other specialty chemicals. In fact, exports account for close to 48% of its total sales. Consequently, the company has also benefited from a weaker rupee. Its revenues are likely to grow at a CAGR of 18% in the next year, while profits are expected to grow at a CAGR of 24%. The stock has an upside target of 11.13%. Biocon has been a strong player in the bio-pharmaceuticals space, and its active pharma ingredients (APIs) are exported to nearly 120 countries across the world. The tie-up of Mylan and Sandoz is also likely to create new opportunities for Biocon. With an expected CAGR of 114% for PAT in the next three years, the stock offers an upside potential of 19.94%. The NBFC turned bank has emerged as one of India’s most efficient banks with a strong focus on risk management and asset quality. Its gross NPAs are among the lowest in the private banking space. The bank is expected to see an increased contribution from its subsidiaries such as Kotak AMC and Kotak Securities, which are ripe for monetizing at a future date. The company was floated during the dot-com boom and has carved a niche for itself in the last two decades. It has created a strong digital presence, which is the fastest-growing franchise within the IT space. Mindtree is expected to show CAGR growth of 23% in revenues over the next three years. This software company has had a series of deal wins in new and emerging areas of IT. The company is also expected to report revenue CAGR of 17% and PAT CAGR of 23% in the next three years. The stock is expected to have an upside target of 39.56% from current levels. If you were to talk about one auto ancillary company that has consistently met projections in the last 15 years, then this would be it. The last few years have been challenging for the company, especially with the negative market sentiments towards diesel cars weighing in on it. However, the recent correction has made the stock quite attractive. Its revenues are likely to grow at a CAGR of 16%, while profits are expected to grow at a CAGR of 47% in the next three years. Also, the stock is being quoted at a 35% discount to its own 10-year average P/E Ratio. Makes it a salivating bet! A quick ramp-up in Kochi is likely to boost volumes for India’s principal LNG transporter. At just about 10.5 times FY20 earnings, the company offers a compelling and low-risk opportunity for the slightly discerning and long-term investor. This company may have disrupted more industries than any other company in India. Be it plastics, petrochemicals, refining, or telecom, Reliance has done it all. The last 18 months since the launch of Jio has been positive for RIL; further, the recent correction has brought the stock to an attractive price point. While GRMs may be challenging, the growth in petchem and telecom is likely to continue. RIL is expected to show 27% growth in revenues and 18% in profits over the next year in CAGR terms. This leaves enough room on the upside. Finally, we have two more assets to invest in that are outside the purview of pure equities. This may be a good time to buy gold with geopolitical uncertainty increasing. Also, gold could be a direct beneficiary of the ongoing US-China trade war. Another interesting product could be Fixed Maturity Plans (FMPs). With yields closer to 8% on benchmark bonds, this could be a good time to lock in on higher yields. The choice is yours!